Linked genes can become unlinked during recombination; the probability of genes separating depends on their distance from each other. Alleles positioned on the same chromosome are not always inherited together because during meiosis linked genes can became unlinked. Frans Janssen suggested chromosomes become unlinked during homologous recombination, a process where homologous chromosomes exchange segments of DNA. Alfred Sturtevant hypothesized that alleles that were closer together on a gene were more likely to be inherited together rather than alleles that were farther apart and used measurements of recombination between genes to create the first genetic map. When genes are perfectly linked, they have a recombination frequency of 0. When genes are unlinked, they have a recombination frequency of 0.5, which means 50 percent of offspring are recombinants and the other 50 percent are parental types. Mendel’s work suggested that traits are inherited independently of each other. Morgan identified a 1:1 ratio between a segregating trait and the X chromosome, suggesting that the random segregation of chromosomes was the physical basis of Mendel’s model. This also demonstrated that linked genes disrupt Mendel’s predicted outcomes. The fact that each chromosome can carry many linked genes explains how individuals can have many more traits than they have chromosomes. However, observations by researchers in Morgan’s laboratory suggested that alleles positioned on the same chromosome were not always inherited together. During meiosis, linked genes somehow became unlinked. In 1913, Alfred Sturtevant, a student in Morgan’s laboratory, created the first “chromosome map,” a linear representation of gene order and relative distance on a chromosome.To construct a chromosome map, Sturtevant assumed that genes were ordered serially on threadlike chromosomes. He also assumed that the incidence of recombination between two homologous chromosomes could occur with equal likelihood anywhere along the length of the chromosome. Operating under these assumptions, Sturtevant hypothesized alleles that were far apart on a chromosome were more likely to dissociate during meiosis simply because there was a larger region over which recombination could occur. Conversely, alleles that were close to each other on the chromosome were likely to be inherited together. The average number of crossovers between two alleles, or their recombination frequency, correlated with their genetic distance from each other, relative to the locations of other genes on that chromosome. Sturtevant divided his genetic map into map units, or centimorgans (cM), in which a recombination frequency of 0.01 corresponds to 1 cM. Inheritance Patterns of Unlinked and Linked Genes: In (a), two genes are located on different chromosomes so independent assortment occurs during meiosis. The offspring have an equal chance of being the parental type (inheriting the same combination of traits as the parents) or a nonparental type (inheriting a different combination of traits than the parents). In (b), two genes are very close together on the same chromosome so that no crossing over occurs between them. The genes are, therefore, always inherited together and all of the offspring are the parental type. In (c), two genes are far apart on the chromosome such that crossing over occurs during every meiotic event. The recombination frequency will be the same as if the genes were on separate chromosomes. (d) The actual recombination frequency of fruit fly wing length and body color that Thomas Morgan observed in 1912 was 17 percent. A crossover frequency between 0 percent and 50 percent indicates that the genes are on the same chromosome and crossover occurs some of the time. 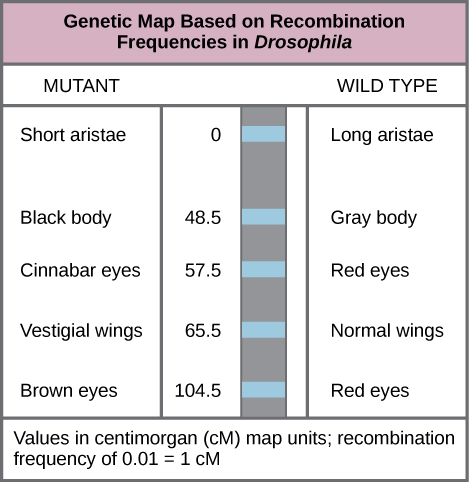 Genetic Maps: This genetic map orders Drosophila genes on the basis of recombination frequency. By representing alleles in a linear map, Sturtevant suggested that genes can range from being perfectly linked (recombination frequency = 0) to being perfectly unlinked (recombination frequency = 0.5) when genes are on different chromosomes or genes are separated very far apart on the same chromosome. Perfectly unlinked genes correspond to the frequencies predicted by Mendel to assort independently in a dihybrid cross. 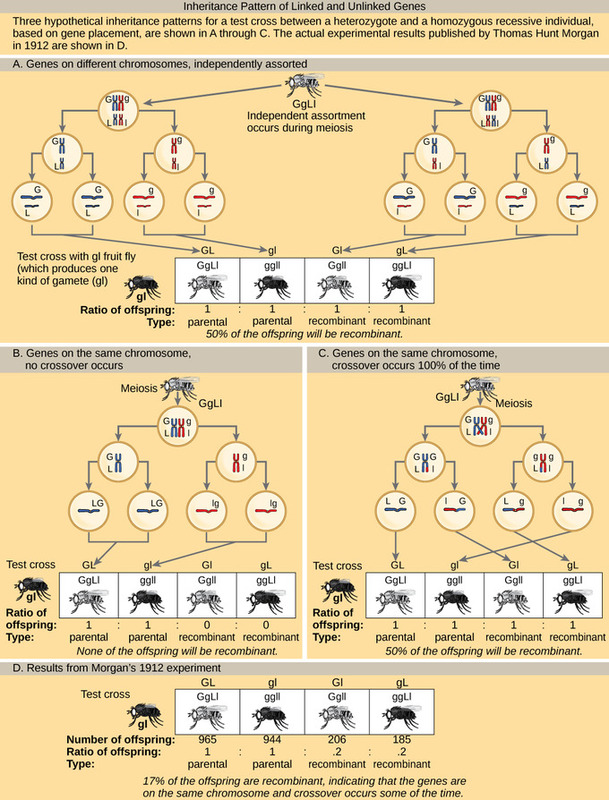 A recombination frequency of 0.5 indicates that 50 percent of offspring are recombinants and the other 50 percent are parental types. That is, every type of allele combination is represented with equal frequency. This allowed Sturtevant to calculate distances between several genes on the same chromosome.